I wish that I had either a coconut grater or a coconut tool. I just couldn't justify spending the money of specialty coconut tools for this single challenge. Either tool would have saved me a lot of time! Maybe next time I'm in Thailand I'll get myself one of those coconut grating stool set-ups. Punch two holes in the top of your coconut with a hammer and screwdriver. Drain coconut water into a glass. If you want to drink it, be sure to strain it first. I tried the water, I will not be buying coconut water in the future. Hold the coconut in one hand. 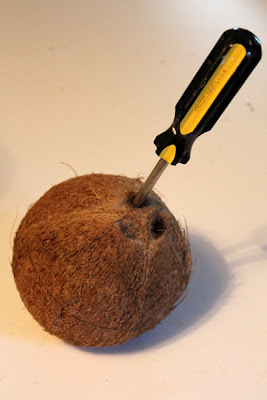 Using a hammer, tap around the circumference of the coconut until it breaks open. 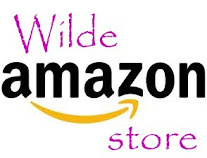 You might have to use some force! Pry the coconut flesh from the shell with a knife or special coconut tool. 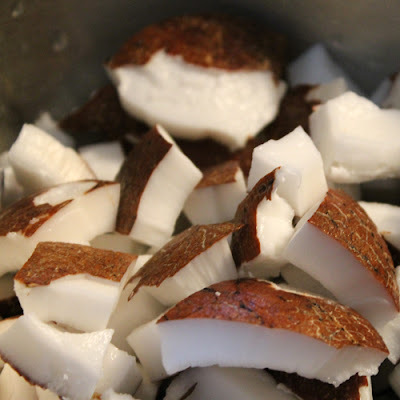 Using a vegetable peeler, remove the brown skin from the coconut flesh. 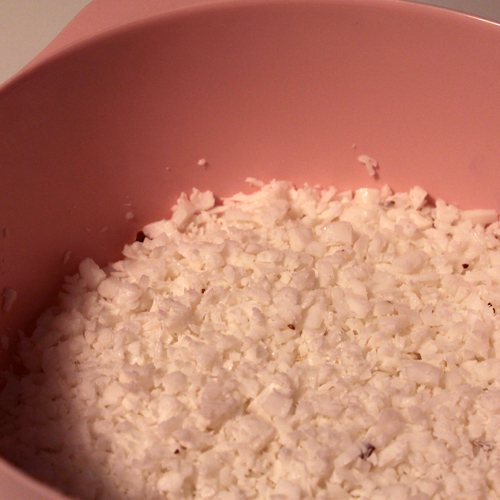 Either grate coconut flesh with a box grater, or finely chop it up in a food processor. 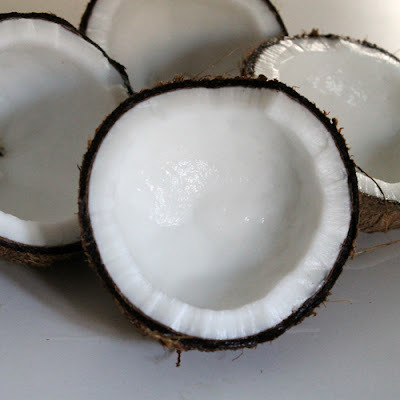 Place coconut in a large bowl. Add 1/2 cup hot water and allow to steep for 5 minutes. Pour liquid and coconut solids into a strainer, lined with muslin, set over a bowl. 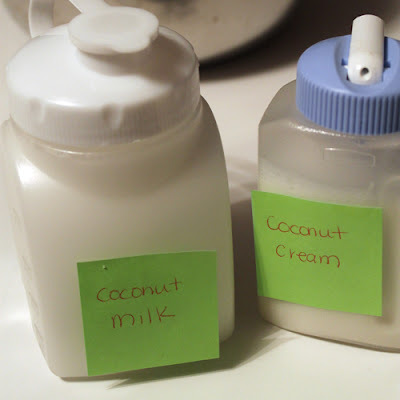 Let coconut milk drain. 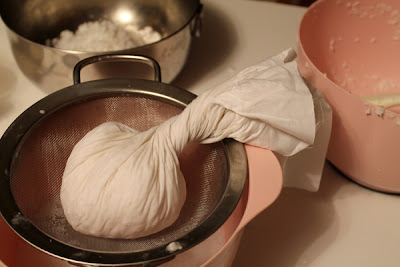 Gather the muslin into a ball and squeeze out the remaining liquid. This is your coconut cream. Return coconut to the bowl and add 1 cup hot water. Let steep for 5 more minutes. Drain and collect the liquid. Squeeze out remaining liquid from the coconut. This is your coconut milk. I used smaller, red chili peppers. If you can find long, red Thai chili peppers, you can use those in this recipe. The sauce has a sweet, yet hot flavor. Remove the seeds and stem from the pepper. Using a food processor or mortar and pestle, pulverize peppers until a paste. Combine vinegar, sugar and salt in a small pot. Bring to a boil over high heat then reduce to medium. Allow vinegar mixture to bubble for 20 minutes, until it becomes a thick paste. Add pepper paste and stir to combine. Cook for another 2 minutes, then pour into a bowl. This recipe calls for a bunch of unusual items that might be a little difficult to source. 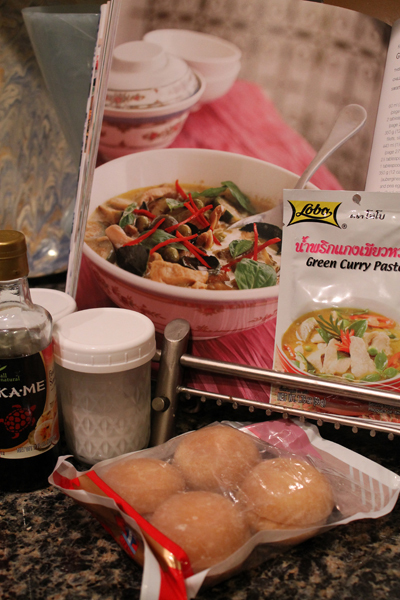 My green curry paste and Kaffir lime leaves came directly from Thailand as souvenirs from my visit last fall. The palm sugar came from a well-stocked place in midtown Manhattan called Kalustyan's. If you are short on Asian markets in your area and aren't planning a trip to Thailand anytime soon, the internet is your friend. Heat coconut cream over medium heat in a large skillet with high sides, until it bubbles up. 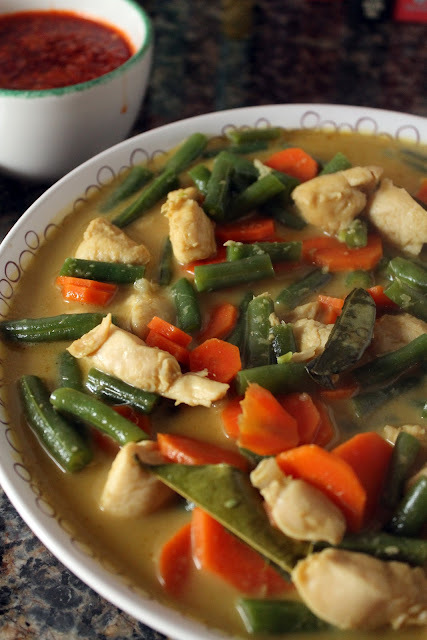 Add green curry paste and stir until combined and fragrant. Add chicken to the skillet and stir. Cook for 7-8 minutes until chicken is no longer opaque. Add coconut milk, fish sauce and palm sugar. Stir to combine and pick up all of the curry paste off of the bottom of the pan. Bring to a simmer and cook for 5 minutes. Add green beans and carrots and cover with a lid. Cook for 5 minutes. Add ginger and kaffir lime leaves. Let bubble for 2 more minutes. Transfer to a serving dish and serve over brown rice with chili sauce.